In the last 50 years, the methodology of large-eddy simulation (LES) has been greatly developed, while lots of different subgridscale (SGS) models have appeared. However, the understanding of the procedure of SGS modeling is still not clear. The present contribution aims at reviewing the recent SGS models and, more importantly, expressing our recent understanding on the SGS modeling of LES in physical space. 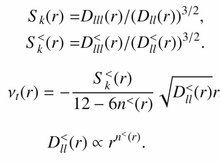 Taking the Kolmogorov equation for filtered quantities (KEF) as an example, it is argued that the KEF alone is not enough to be a closure method. Three physical laws are then introduced to complete this closure procedure and are expected to inspire the future researches of SGS modeling.